So this is the very lovely Run: Dash LS in Lavender (or was it Lilac..). 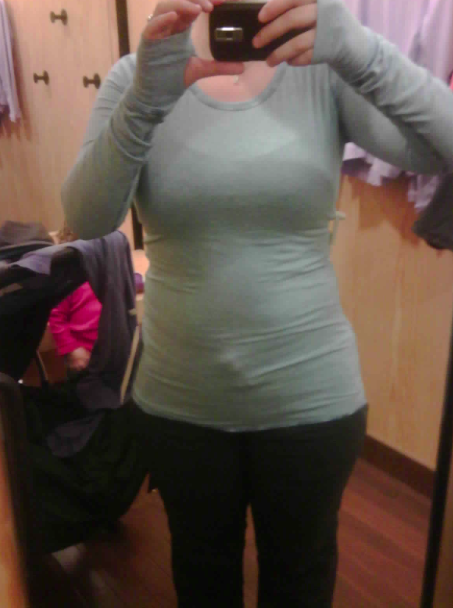 This is the Size 10 which felt large in the chest and upper body/arms but because it’s a form fitting running luon I was in no mood to see what the 8 did to my belly. See pictures bellow for why. 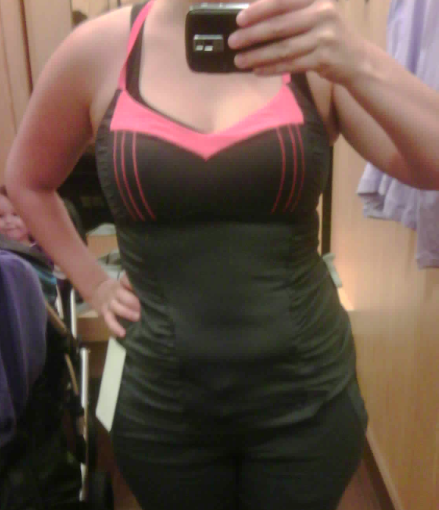 When/If I get this I’ll probably go for the size 8 but motivate myself to tighten things up a bit. I LOVED this top and loved the ruffles. It’s basically a really great warm LS shirt you can wear out and about, under a vest or jacket and it just doesn’t look like an athletic top save for the little reflective detailing at the outer wrist which is quite subtle. 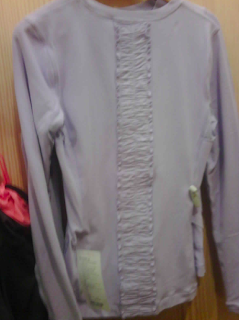 I would love to get this top in a different color though which is why in the end I left without it. 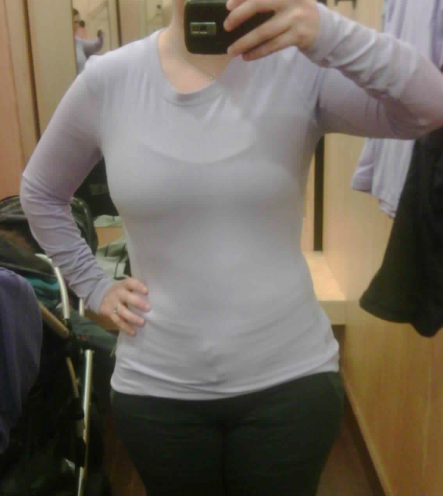 I do like the Lilac but I have an Inspire Pullover in Lilac and I need something a little bit different. They had Black and Teal as well but those weren’t tempting me today. The back ruffle is gorgeous. I don’t care what you poo-pooers say!!! 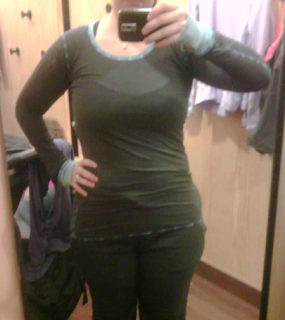 Happy Heat tank ($52) in size 10, Persimmons and Coal. Cute, has adjustable straps that you can wear crossed or not crossed, moderate support with a built in bra. This Persimmons and Coal was the prettiest combination that jumped out at me I liked the gathering at the sides and the bottom is quite roomy around the belly but because of the gathers + luxtreme it pulls it in close to the belly showing all your ugglies (as seen bellow, it does not hide mummy tummy). Although I found this a cute tank I don’t have a need for a tank right now and wasn’t ‘in love’ with it. "Run: Dash Long Sleeve in Teal Zeal"
"Cabin LS, Dash Tank Front/Back and Dash Pullover Details"